TrustedHousesitters.com is the most popular House Sitting website out there. 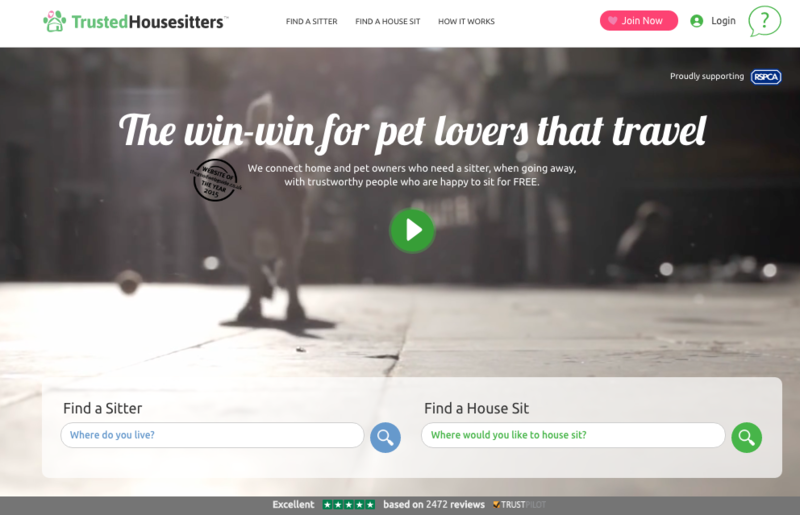 TrustedHousesitters connects home and pet owners who need people to take care of their home and pets while they are away. If you are a pet lover looking for a free place to stay, and you don’t mind taking care of everyday issues like feeding the cat or taking the dog for a walk, then through TrustedHousesitters you could find accommodation without spending a penny (only the membership fee)! Although most of the house and pet sitters provide their services for free, you might be able to find paid vacancies. TrustedHousesitters offers the most robust verification process available within the sharing economy through a brand new partnership with digital verification and security experts, Onfido. Include a photo, have a reference (character, employment, landlord or house sitting) and complete lots of information about yourself to have more chances of getting an assignment. Most house sitters don’t charge for their services, however TrustedHousesitters is open to professional house sitters who may require a fee for their services. Check the F.A.Q section to find tips on how to have the best chances of getting a house sitting assignment. Once a TrustedHousesitters member has verified their contact details and received an external reference to achieve basic verification, two further levels of checks will be offered through Onfido. The standard level requires the user to hold up an ID card (driving licence or passport) to their screen, from which Onfido is able to verify that the ID is legitimate and matches the user’s identity. The enhanced level allows house and pet sitter members to carry out a full certified criminal background check for a further optional £35, offering home and pet owners complete peace of mind when selecting their sitter. Both options add weight to the member’s trust profile, increasing their chances of securing the best house sits. TrustedHoussitters.com is perfect for those looking for somewhere comfortable to stay, with the added bonus of knowing you helped stop and unwanted trip to the kennels. If you plan on being out and about a lot, maybe it’s not for you – but if all you want is free short term accommodation, with a furry friend to keep you company while you’re there, sign right up! Check out our Short Term Accommodation in London category to find more websites offering short term accommodation vacancies in London.